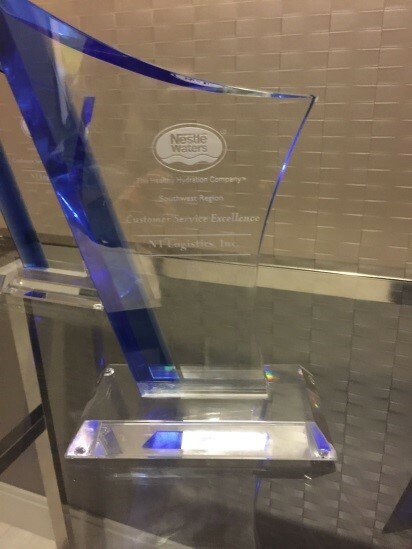 NT Logistics Receives 7th Customer Service of the Year Award from Nestle Waters!! FRISCO, Texas (April 6, 2017) – We are extremely thankful to receive our 7th Customer Service of the Year Award from Nestle Waters North America! Nestle Waters has been an incredible customer for over 10 years and we are honored to work with them. NT Logistics has strived to always deliver impeccable service to each and every one of our valuable customers. Receiving an award for our relentless efforts is an honor as well as a goal to continuously exceed the standard of service our customers expect. Thank you, Nestle Waters, for allowing us the opportunity to add value to you and your company each and every day!